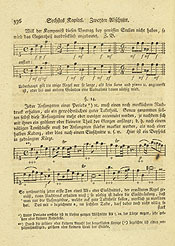 The Klavierschule of Daniel Gottlob Türk (1750-1813) was written at the time when the pianoforte was replacing the clavichord as the principal domestic keyboard instrument. This book deals with aesthetic questions and subtleties of touch and expression in more depth than many of the earlier tutors. The chapter on accentuation demonstrates conventions of musical grammar and emphasis that depend on context and were often not written out in the score. Example 14 is particularly interesting in this regard, as the + signs denote a hierarchy of accentuation derived from the ordering of strong and weak beats and their place in the musical phrase. Türk accompanies the upper example with the explanation that f and p, as a rule, correspond to the strong and weak parts of a measure. "If a composer wants otherwise, he must indicate it in the score." Daniel Gottlob Türk. Klavierschule. Leipzig; Halle: Auf Kosten des Verfassers, 1789.